Guardian Tactile Systems was incorporated in March 2003 to manufacture and market high quality Tactile Ground Surface Indicators (TGSI) for the vision impaired. 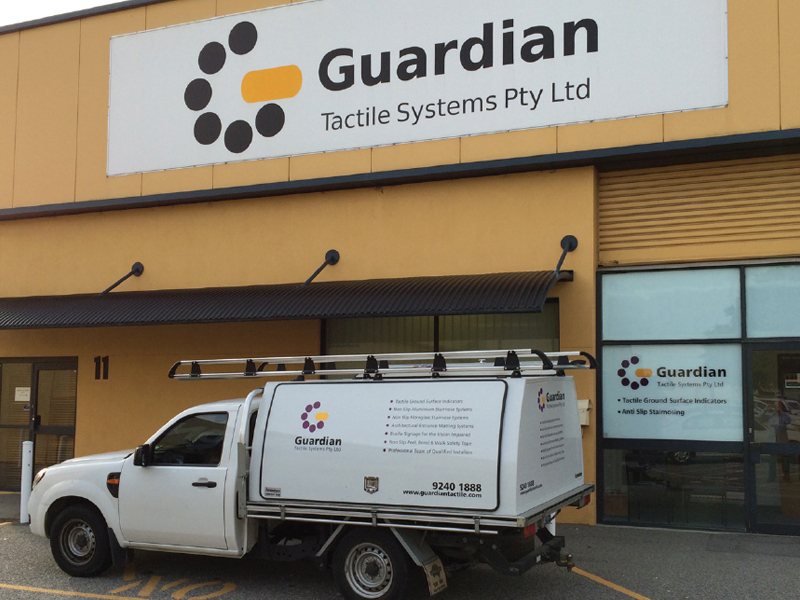 Guardian Tactile has successfully completed over 100 contracts to supply and install tactile indicators to construction and infrastructure projects in Perth, WA. All contracts that Guardian Tactile undertake, fully comply with Design for Access and Mobility AS/NZS 1428.4.1:2009. Guardian Tactiles System’s range of tactile indicators have been tested by the CSIRO for strength, durability, luminance and slip resistance. For further information see our technical data sheets and CSIRO Test Reports. Guardian integrated tactiles are manufactured from Bayer Desmopan high-tech polyurethane. This product has a proven wear resistance equal to granite, is lead free and UV resistant. Guardian is so confident that our Tactile Ground Surface Indicator will withstand any natural condition, that we offer a 10 year warranty. Strong, durable and designed with extreme conditions in mind, the Polyurethane material gives Guardian Tactile Indicators a lasting edge and superior performance. The proprietary water-proofing self-adhesive backing is also included free with Guardian integrated tactiles. Guardian Tactile Systems is committed to helping building accessibility to people with limited vision. For further information on building accessibility design, refer to this article from the Australian Human Rights Commission. We have many long-term customers with whom we have been doing business for many years. Top rate service and product support is given to all our customers, both large and small which is why we receive much repeat business from many local government departments, building companies and architects. We offer a genuine and dependable service and prompt delivery throughout Australia. Send us your feedback and service rating. Guardian Tactile Systems have completed many tactile supply and installation projects over the years. Take a look at some of our tactile projects undertaken in the Perth, WA metro area. These projects demonstrate the supply and professional installation by Guardian Tactile Systems of the various product ranges to suite the architectural design, function and building material at each site. Australian Standards AS/NZS 1428.4.1:2009 require the use of tactile ground surface indicators in a wide range of areas. See examples of where Guardian Tactile Systems have installed TGSIs for access mobility.